I suppose the good thing about always carrying a camera around is the fact that once in a great while you might get the chance to witness something truly dramatic. That happened to me in Butte back in October 2003, when I looked out a window one morning and saw this. 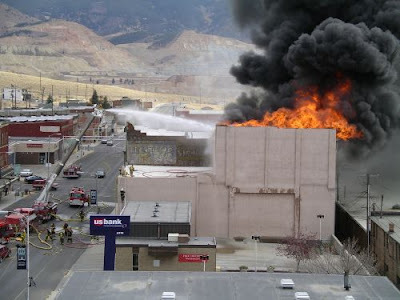 Butte's had more than its share of fires over the last few decades, of course ... caused both by accident and by intent. And almost always when it happens, something historic and irreplaceable is lost.